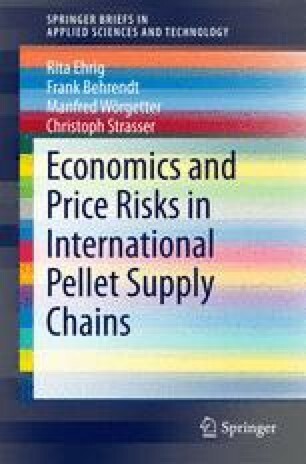 This chapter summarises how market aspects affect total biomass supply chain economics and how highly volatile prices influence pellet supply costs. The individual ranges of price variations in a 3- to 10-year period are outlined with raw material prices, freight rates, and exchange rates between origin currency and Euro as the predominant factors. These price aspects - compared with the final EU market price–are discussed from a holistic and close-to-market viewpoint.